After I became "differently-abled" I volunteered at our local food pantry and soup kitchen for about 6 or 7 years, everytime the loads would come in from the stores and local farms, with a variety of beautiful squash, most everyone looked at me and said, "Theresa, we have more 'gourds' for you." They thought them only good for rustic, harvest-themed table decoration and never did add them to our food give away. Very seriously, the public's loss was my gain. At one point. I even offered to print up recipes to go with the ingredient, but I was overruled as it being "too difficult" of a fruit/vegetable for most people to work with. So, now, finally, I have the voice, and platform, here to tell the Public, that the opposite is true! They are very easy to work with! With the morning and evenings, finally beginning to get crisper, my mind automatically begins to turn to memories of wonderful, comforting soups. My mother and grandmother were famous for their hearty chicken and beef stews, I, on the other hand, have been more known for my various rustic vegetable or squash "cream-style" soups. 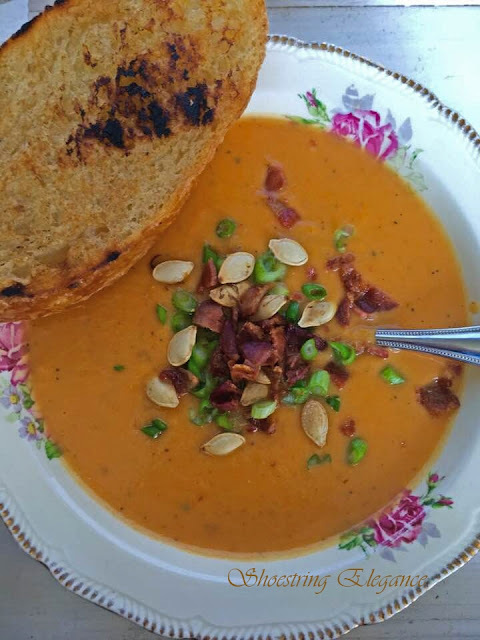 My Savory Roasted Pumpkin Soups is one of my personal favorites and most requested recipe. This is not your standard Pumpkin Soup recipe, with only a few ingredients, highlighted by some spice you would normally associate with pie, it is wonderful and very savory and quite hearty. These pumpkins are also backed with nutrition. According to Nutriondata.self.com: This food is low in Saturated Fat, and very low in Cholesterol and Sodium. It is also a good source of Vitamin E (Alpha Tocopherol), Thiamin, Niacin, Vitamin B6, Folate, Iron, Magnesium and Phosphorus, and a very good source of Dietary Fiber, Vitamin A, Vitamin C, Riboflavin, Potassium, Copper and Manganese. Mind you, you aren't using a jack-o-lantern pumpkin here, you need to buy, specifically, a Baking Pumpkin or maybe your store calls it a pie pumpkin. 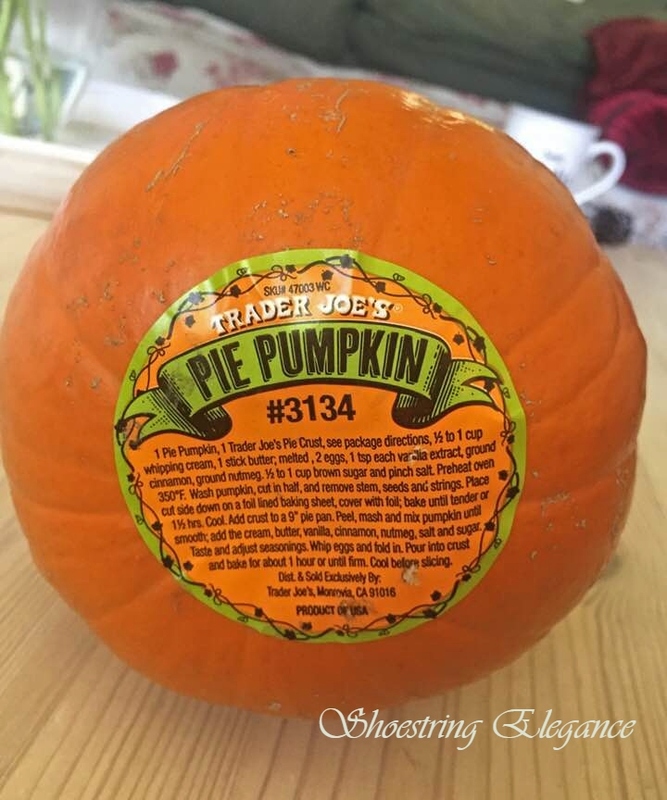 I get mine from our Trader Joe's, just because they have a large variety, you can buy yours wherever you can find them. Local farms carry a great variety. Average cost for these beauties is between $1.99-2.99. Be sure and grab some before they are gone again until next year! You may notice they are just a tinge darker than the "regular" Pumpkins that you might by for decoration. Still, they are quite sweet and unassuming. The task of cooking them, that people are SO concerned by couldn't be easier truly if you tried. When you can easily pierce through the pumpkin skin with a dinner fork they are done! That's it! Not so complicated, right? Another wonderful feature to these little gems; no peeling necessary. As you can see, when left for 5-10 minutes after roasting the skin simply pulls off leaving you with all that scrumptious pumpkin meaty goodness. A couple turns in a bowl with your wish and you have made your very own organic pumpkin puree. 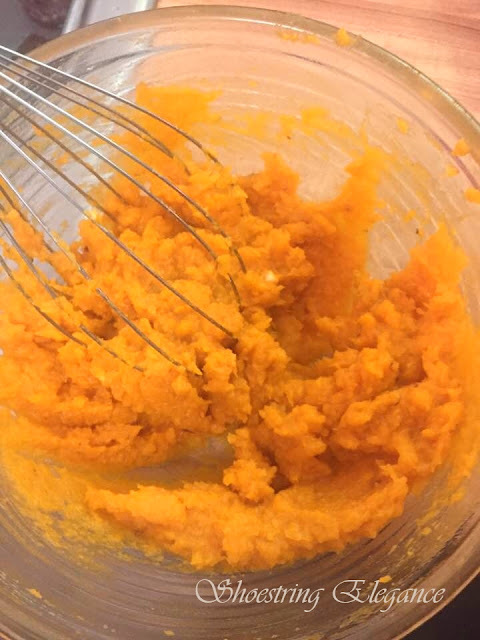 Each 1-1/2 to 2-2/2 lb pumpkin yields about 2-1/2 cups of this beautiful puree. you are going to use it all in this soup. be sure not to let then brown. Replace lid and increase heat to medium high and let cook down for another 30-40 minutes. 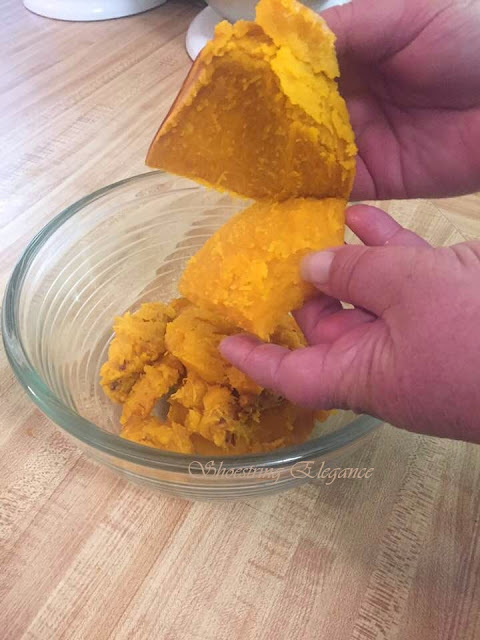 shredded colby jack cheese (or half cheddar, half jack cheese) You want to do this at this step because your mixture will be hot and will easily melt your cheese and combine well with your other ingredients. Return your blended mixture to a soup pot and keep on a very low setting, be careful here and when reheating. You don't want to let your soup boil or you may get some separation of your milk and then it just loses its wow. I love to toast my pumpkin seeds well and toss a few on top for texture and taste, along with a few crumbles of bacon, and chopped green onions. You can top it anyway you like! I've also simply tossed some yummy garlic salad croutons on top with the leftovers, equally yumm! 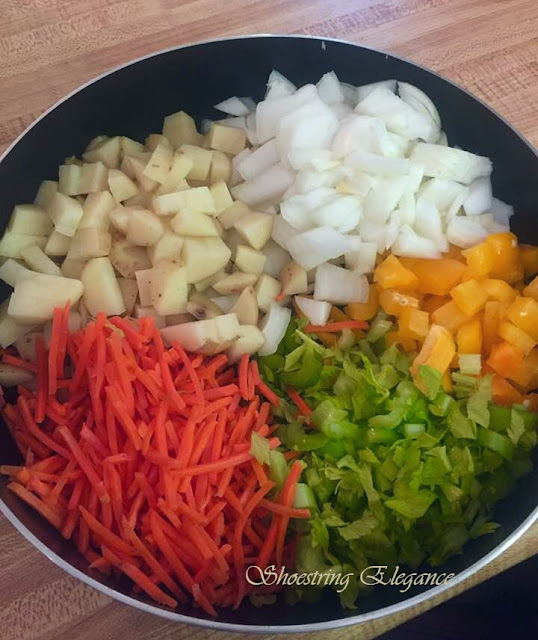 While cooking your vegetables, add 1/2 tsp of pepper, 1 tsp each minced, dried chopped onion/garlic, 1/2 tsp of sugar, add any desired additional salt, 1 tsp of Mrs.Dash original seasoning. It's a wonderful and flavorful blend. 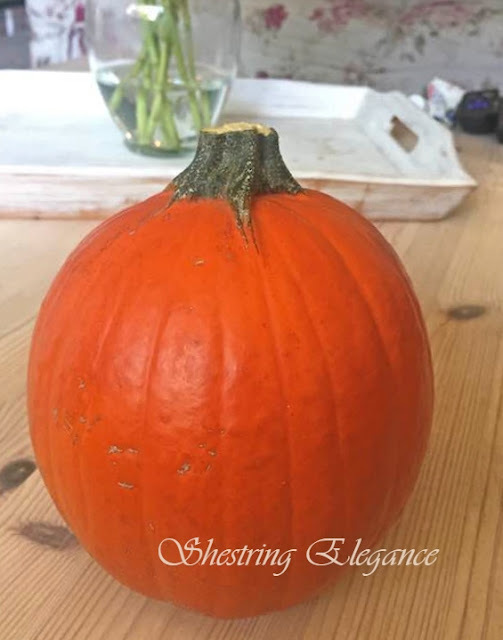 We love roasted pumpkin, it really takes on a very rich flavor when roasted. This soup will be delicious! Thanks so much for sharing with us at Full Plate Thursday. Hope you have a great weekend and come back soon! I’m so glad, Miz Helen. Yes, it does. Super yummy. Im so grateful for your party and taking the time to leave me your kind comment. Happy Weekend to you! I hope to be back very soon. Thank you so much! I'm so glad you like it. It is simply heavenly. Popping over right now! Your post is featured on Full Plate Thursday this week! Thanks so much for sharing it with us, we have pinned it to our features board. Have a great week and come back real soon! This pumpkin soup sounds marvelous and it looks so pretty. Thank you for sharing at Happiness is Homemade. I love pumpkins, and this soup looks amazing! Found you via the Happiness is Homemade hop this week. 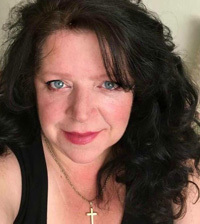 I'm looking forward to reading more of your posts! Your Pumpkin Soup looks so appetizing, Theresa! It's one of the nicest-sounding recipes I've seen. Thank you so much for sharing with the Hearth and Soul Link Party. I’m featuring this post at the party this week. Hope to ‘see’ you there! Have a great week ahead!